"When I wake up in the morning, I can't decide whether to enjoy the world or improve the world, that makes it difficult to plan the day." "I'm out to change my world." "Each of us must be the change we want to see in the world." My friend, Keri Wyatt Kent, was on Midday Connection today with Anita Lustrea and mentioned her visit to our shelter in East Garfield Park and how being there can affect one's perspective on life. The show is about listening to the story of our lives and to God's voice in the middle of our pain. Keri is the author of Breathe: Creating Space for God in a Hectic Life and Listen: Finding God in the Story of Your Life. "The racism is so raw here," said Barbara Major, a community activist who co-chaired Mayor Ray Nagin's Bring New Orleans Back commission. "People were outraged that people were dying. People been dying," she said. "They should have been outraged that children didn't get a decent education. That there wasn't decent housing here (just) like in every other city in the United States." Sunday, at the River City Community Church, Pastor Dan Hill spoke about being God's friend. One of his points was that we should seek God's face. He said the word for "face" is the same as the word used for "presence". We should seek God's presence. It reminded me of Psalm 4:6 which I studied recently where David prays, "Let the light of your face shine upon us, O Lord". I thought about seeing God's face and experiencing God's presence in the faces of the people identified in Matthew 25; the hungry, the thirsty, the imprisoned, the strangers. Jesus said what we do for them, we do for Him. I also listened yesterday to an audio of Keri Wyatt Kent on Midday Connection in which she says that instead of asking "What would Jesus do?" we should ask "What if this was Jesus?" When we get behind someone at the supermarket who is slow, or we interact with someone who seems difficult, we can ask ourselves, "What if this was Jesus?" We seek God's face when we go into our closet to pray, and also when we see Jesus in the faces of the broken. Psalm 34:18 says the Lord is close to the brokenhearted. When we get near the broken, we get near God. We experience God's presence. "May the light of your face shine upon us, O Lord." My friend and co-worker Nancy Hall has given me permission to post the following email I received from her. I just started reading The Same Kind Of Different As Me and can already tell it is a "must read". One of our Breakthrough volunteers, Sharon Durling, called me a few days before my vacation and felt compelled to strongly recommend that I read the newly published book, Same Kind of Different as Me. It's a true story of an affluent white couple who volunteer at a homeless shelter, in Ft. Worth, TX, and meet Denver Moore, a homeless guest. There's a transformation process that happens for the couple as well as for Denver that's quite amazing. I began to read the book on the plane. The story was so riveting that I finished the book by the end of the plane ride (six hours later). I concur with Sharon that it's an amazing story that our staff, guests and volunteers would be positively impacted by. It's most definitely written from a Christian perspective but it doesn't hit you over the head with the bible in a negative way. It's truly a story about grace. And, it fits very well with our Breakthrough values. The authors, Ron Hall and Denver Moore were recently interviewed on TV. The Chicago Tribune reported today that new rules which are part of the pension reform legislation make it easier for indiviuduals age 70 1/2 or older to donate money to charity directly from their IRA's. Gifts up to $100,000 are credited toward the donors minimum withdrawal and are tax deductible. According to Sandra Block in USA Today, an individual would need to roll money from the 401(k) plan into an IRA "before they could make a direct contribution to charity." 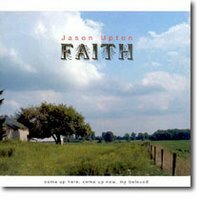 Poverty by Jason Upton from his Faith cd. Can't buy the Kingdom of God? Is incarceration the new slavery? "According to the book, The Covenant, black women born today are five times more likely to go to prison in their lifetime than black women born in 1975. Also the book states, One in every 18 black women born today can expect to go to jail in her lifetime; this is six times the rate for white women. Fifty-seven percent of black officers believe that police officers are more likely to use physical violence against African Americans than against white people, while only 5 percent of white law enforcement officers agree." 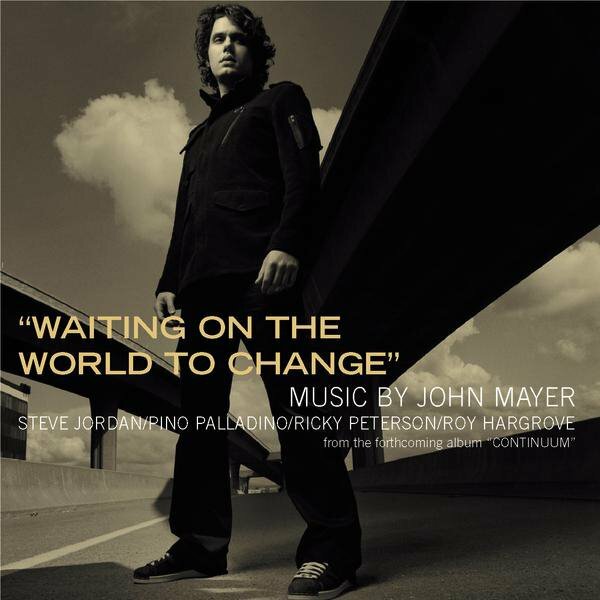 John Mayer expresses the lament of this generation in his song Waiting on the World to Change. He says, "It's not that we don't care, it's just that we feel we don't have the means or the power to change the world, so we wait." So, let's raise a flag and stop waiting. The world can be changed, one soul, one community, one city, at a time. We can change the world. Jesus prayed for God's kingdom to come on earth as it is in heaven. I, for one, am joining that movement! Check out the Pipecleaner Dance ! I mentioned a few weeks ago that I am facing one of the biggest challenges ever in my ministry with Breakthrough. 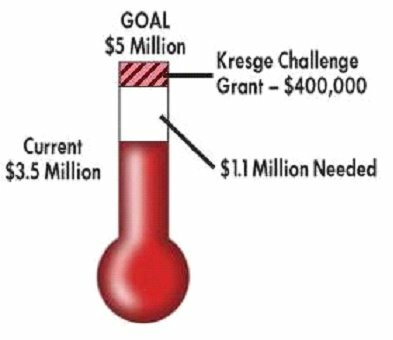 We still need nearly a million dollars in our five million dollar capital campaign to get our building rehabbed to house our men's services program, our employment program and our administrative offices. The problem is, we have not been able to get financing to start construction without knowing where that last million is coming from. I have heard that Mother Teresa once walked into a factory building in Calcutta and simply told the owner that the Sisters needed the building to house the men and women that they were assisting to die with dignity and the owner gave her the building. I need that kind of courage. Bill Hybels said at the Leadership Summit that if a facility is standing in the way of growth we should "just raise the money". He made it sound so easy! I am learning that it is not really about the money. God knows our need and will provide at the right time. It is about learning the lessons on the journey. I am learning to be more courageous, more trusting, more confident in God's provision and grace. Our men are moving out of their present center this weekend and it is going to be difficult for awhile. We are losing our food pantry space and will not have adequate showers. The window air conditioners in the three flat we will occupy continually blow the fuses and the bathrooms are moldy. But in the midst of these conditions we will grow stronger and I am growing more passionate about seeking out the new partners we need to get the job done. God knows I am weak and an introvert. I am being pushed out of my confort zone. It's all part of the plan. We do need pledges to the campaign, but more than that we need Jesus. I know that might sound trite or like I am over spiritualizing, but it is really a great adventure. Here's a link to the Codex blog. His August 12th entry includes a download of the Bono-Hybels interview at the Leadership Summit that everyone is talking about! Of course we all want to end homelessness. Chicago is rallying behind a ten year plan to end homelessness which is now in its third year. The plan calls for a transition from the present shelter system to a new system of interim housing with short term support which will directly refer individuals without homes into permanent units. While I back the plan to end homelessness, I have several concerns. I have been concerned that shelters are being closed prematurely, before an adequate number of affordable permanent housing units have been identified, putting people out on the street without any support at all. At Breakthrough we are trying to move toward providing interim housing but have not been able to come up with funding to stay open all day every day. I am concerned that while we are growing the number of permanent affordable housing units through such new legislation as the Rental Subsidy Bill passed by the State Legislature last year which will add 2000 units of affordable housing, we are not allocating adequate funding to the support services that will ensure that residents with multible barriers to life stability will be successful in staying housed. While I agree that the motto, "Housing First", makes sense, "Housing Only" does not. People who are desperate enough for housing to go to the Chicago Department of Human Services or organizations like Breakthrough for help, are already isolated and need to be drawn back into healthy community, not locked behind close doors, out of sight and mind, without any support. Nothing can replace the power of the supportive personal relationships that are built through grassroots organizations and ministries like Breakthrough. It is also not a good use of funds to subsidize someone's housing indefinitely, when perhaps, with counseling and job opportunities, he or she could transition to be able to support themselves without the subsidy. The plan needs lots of money that we just don't have and aren't likely to find as federal funding is being cut back. Permanent subsidized housing costs about $6,000 per year per individual and that's without any support services. Adding services would cost another $2,000 per individual per year. 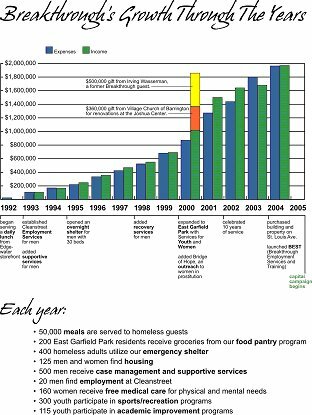 At Breakthrough we will house and provide support services including meals and counseling for about 800 unduplicated individuals this year (many of whom will move into unsubsidized permanent housing) at the cost of about $1250 per individual. I don't want to be negative. These are complicated issues and I know those of us who are trying to make this plan work are well intentioned. I sit on a city board and know the key players very well. They are hard working public servants who are doing everything in their power to better the lives of Chicago's poorest populations. I commend them and have thrown my hat in the ring with them to look for creative solutions. The Chicago Coalition for the Homeless has published a pamphlet identifying some of the concerns I share. We need strong leadership in finding answers to the questions they are bringing. I didn't get a chance to blog last week. I had a house guest in for the week and didn't want to be rude with my nose in my computer. I attended the Willow Creek Leadership Summit Thursday through Saturday. It is always really great and this year was no exception. I wish I had time to write about what Jim Collins, Patrick Lancioni, and Wayne Codeiro had to say. But I want to highlight that James Meeks was one of the speakers. 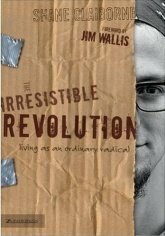 He and Bill Hybels have become friends. Bill confided that he has had a conversion in recent years in realizing the urgency of racial reconciliation. Yeah!!! He has accompanied Meeks on several justice journeys to Birmingham and Selma. It is encouraging to see Willow become more interested in racial justice. Another highlight for me was a Bono interview with Bill Hybels on video. He challenged church leaders to get involved in ending poverty and to address the AIDs pandemic. Willow is making the DVD of the Summit Bono interview available to groups in attendance who will commit to use it to show their people. Much of what he said was also reflected in his message at the National Prayer Breakfast which I linked to in my blog in February. It's a beautiful thing when folks in poverty are no longer just a missions project but become genuine friends and family with whom we laugh, cry, dream, and struggle. One of the verses I have grown to love is the one where Jesus is preparing to leave the disciples and says, "I no longer call you servants... Instead, I have called you friends." (John 15:15) Servanthood is a fine place to begin, but gradually we move toward mutual love, genuine relationships. Someday, perhaps we can even say those words that Ruth said to Naomi after years of partnership: "Where you go I will go, and where you stay I will stay. Your people will be my people and your God my God. Where you die I will die, and there I will be buried" (Ruth 1:16-17). And that's when things get messy. When people begin moving beyond charity and toward justice and solidarity with the poor and oppressed, as Jesus did, they get in trouble. Once we are actually friends with folks in struggle, we start to ask why people are poor, which is never as popular as giving to charity... Charity wins awards and applause, but joining the poor gets you killed. People do not get crucified for charity. People are crucified for living out a love that disrupts the social order, that calls forth a new world. People are not crucified for helping poor people. People are crucified for joining them. I have been recognizing an urgent need for us to pray together. To that end I have set up a conference prayer call for friends of Breakthrough to make every Friday morning at 8:00 AM (USA Central Time). You are welcome to join us. Just email me and I will send you the call in information and our guide to prayer. It will be exactly fifteen minutes, starting at 8:00 and ending at 8:15. My friend, Rita, sent me this quote from Abraham Lincoln. As I read this article by Eric Janzen in the Clarion Journal of Spirituality and Justice, I related to his experience of weeping over injustice. As I listen to disturbing experiences of painful injustice my heart also breaks. I recall one day not long ago when a funder from a foundation stopped by Breakthrough for a site visit. The three of us Breakthrough staff who met with the funder had just been in a BUILD meeting in which we had listened to community members talk about their experiences of racism. As we described to the funder the reasons why we do what we do, and why we need to speak out against such injustices, we all three began to cry in front of the funder. We had to pass around a box of kleenex. Janzen says he has learned to sit in that pain and recognize that the emotion is from God's heart of love for people and rage at injustice. Here's a quote from the article. One day I read an article that described the horrific abuse of a child. A wave of emotion washed through me and I began to weep. Tears poured out of my eyes and I hastily wiped them away, trying to retain some sense of composure. I was, after all, sitting in a coffee shop surrounded by people. I was overcome with deep sorrow for this child, and at the same time, I felt a rage rising up within me towards those who had caused this child’s terrible suffering. I wanted to turn the page, to shut off the emotions, which were so raw and almost too painful to handle. Then I felt the gentle whisper of the Lord and He seemed to say to me, “You are feeling a fraction of what I feel for this little one. You are weeping because I am weeping. Your heart is hearing my heart-cry for that child.” I paused and considered what I felt the Lord had spoken to me. I chose not to turn the page. I chose to let the sorrow I was feeling run its course because I love God and I wanted to show Him that I would care about what He cared about so much. After that experience, something changed within me. There have been many times now that I have found myself weeping or becoming angry over the injustices that I read about or see in the news. Each time this happens, I know that I am feeling something of what God feels about those situations. He has set me on a journey to know Him more deeply. I have begun to know the God who loves justice and hates injustice. In a 15-page analysis of the Chicago Public School district's 2007 budget, the Cross City Campaign for Urban School Reform claims Chicago Public Schools officials are using a variety of tactics to siphon money away from the system's most disadvantaged students. Here is a link to the article in this morning's Chicago Tribune.